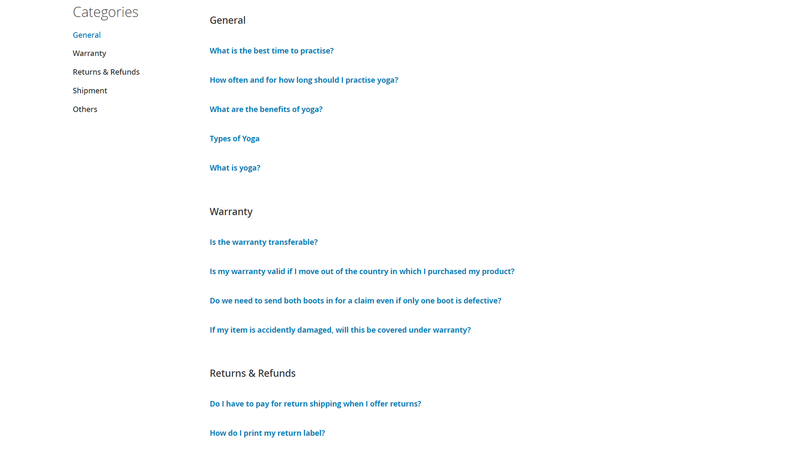 By displaying all questions and answers on one page it will save your customers' time of redirecting page by page, increases their satisfaction. On the other hand, if customers do not get the answer for their concerns, they may leave the site and go to another store. With just one click on the question, the answer will be demonstrated right under and the customers get the answer immediately. Every customer has their own question about different subject before deciding to purchase for a product, and they tend to expect to get the answer as soon as possible. This feature satisfies customers demand that answers to what they concern about without wasting time redirecting to other pages. The simple display made it is no problem for web owners to create and make any changes to FAQ categories and items. 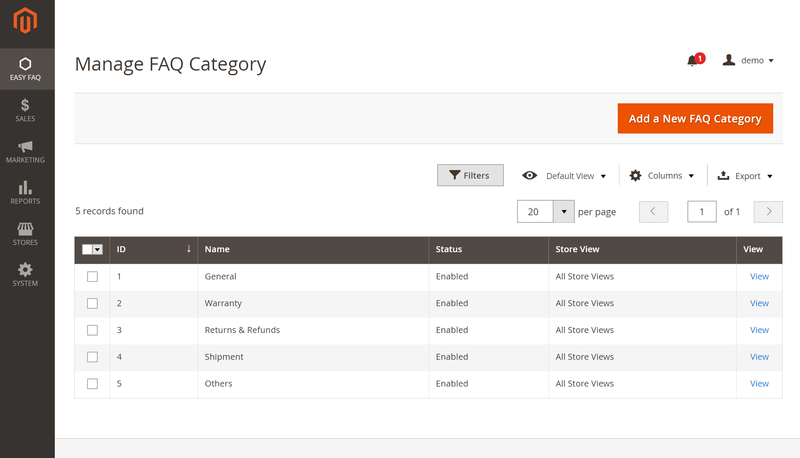 You can manage categories and FAQs in the configurations setting page. The more FAQ you provide the more satisfaction you may get from the customers. Prepare as much as possible the basic questions and answers, you will save a lot of time for yourself as well as your customers. There are multiple choices for page layout and page style, you can obviously manage your FAQ page layout and style as the way you expect it to be. - 1 Column: All questions and answer are displayed in 1 column. - 2 Column Right Sidebar: Categories and questions are divided into 2 columns with the sidebar on the right. 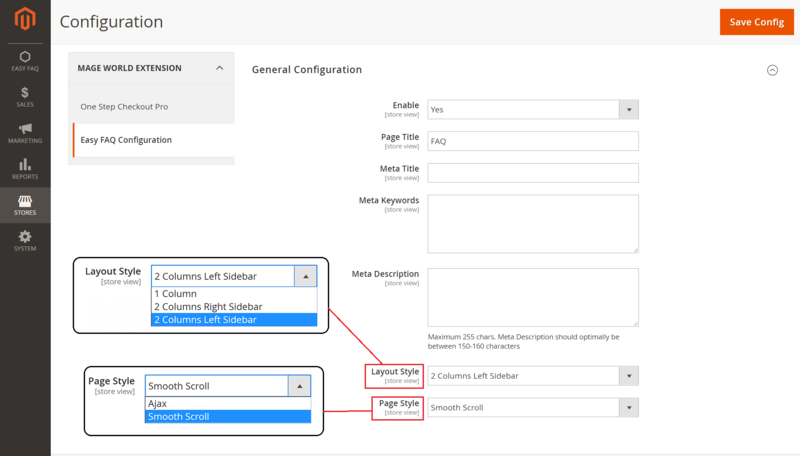 - 2 Columns Left Sidebar: Categories are demonstrated on the left of the page while questions are listed on the remaining column. - Ajax: This style shows categories one by one. 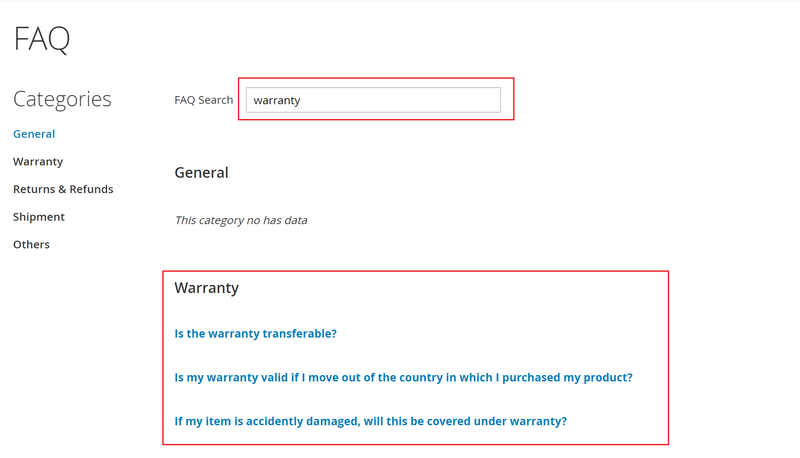 When you click on a category, the page displays only the questions belongs to that category. - Smooth scroll: When you click on a category, all the questions are still listed on FAQ page but the selected category will be focused. This style gives a slightly look with the sliding motion. Very easy to use and very easy to install. Thanks to Mage-World for helping me out with some minor things! Very fast response time! Very good support. They helped me with a feature that this extension doesn't support, but they added if for me, quickly and for no extra costs. Works Fine! Fast support! Easy to use. Highly Recommended. Like the name of extension, it is really easy to install and use. It just take me 10 minutes for making to work on my site. Thanks. Q. Is this extension compatible with any other extension? A. Yes, our Magento 2 FAQ extension is already integrated and working well with any extension for Magento 2. There are some recommendations following: Magento 2 Free Gift Pro, Magento 2 FAQ Extension, Magento 2 Affiliate Pro. If you have any question in installating the extensions feel free to call for support via here. Q. Is it possible if i want to add more custom features to the extension? A. Definitely YES! Our extension is 100% open-source so you can freely customize it as the way you want. Otherwises, you can always use our professional customization service. Please send us your request through this link and we will make your ideas become real. Q. How can I access to the FAQ page? A. The FAQ link is dislayed right on the top right of the page, it is very easy to be recognized, click onto the link you will be directed to the FAQ page. Q. Is support service for free? A. It doesn''t cost any fee for support, so you can freely ask us anything, we will try our best to help you. Q. Currently i'm using a custom theme, will the extension run well on my theme? A. Our extension bases on Magento 2 coding standard very closely so be assured to install the extension, it can be suitable on any custom theme or design that doesn't affect to them. If you have any problem, feel free to contact us, we're always available to support you. Q. 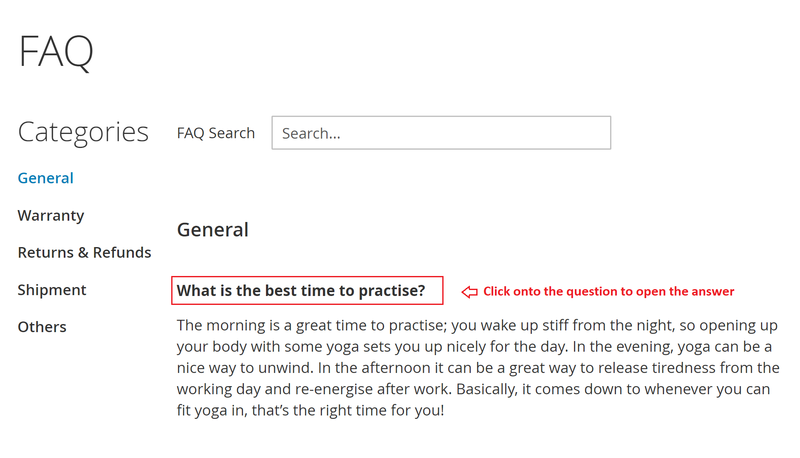 Why do I need FAQ extension for my site? A. The customers often want to ask something when they are interested in an item while you are not available for 24 hours a day to support and answer for their question. Though, the customers may be not patient enough to wait for your response and leave your site, this meant you may lost the sales. The FAQ extension provides you an opportunity to support your customers instantly, You will add the frequently-asked questions to the page and customers can visit there to search for what they concern about. + fix only search in category and answer, not question.